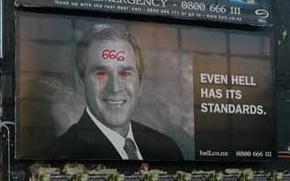 President Bush has never been to New Zealand, but if he goes, don’t expect him to grab a slice at Hell Pizza. The chain has made a habit of insulting the president in its ads. There’s the one shown here, which has been defaced. Then there’s an even more blunt execution, which carries the same photo along with the line, “Hell. Too good for some evil bastards.” The country’s ad-standards board is discussing this second ad today, to decide if it can stay up.